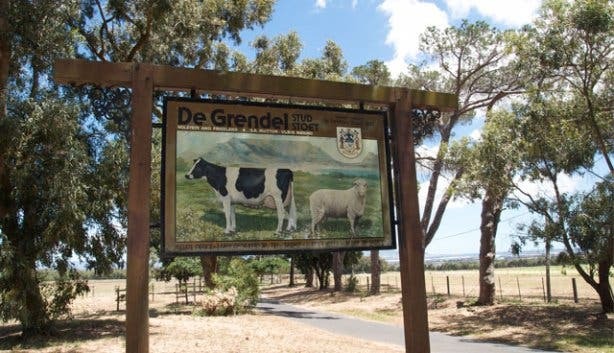 De Grendel Estate is a 15-minute drive from the centre of Cape Town, but beyond the modest gate of the Durbanville winery is another world. Leaving the urban sprawl outside, a sense of history prevails, and indeed, the estate and its lineage claim a rich political past. 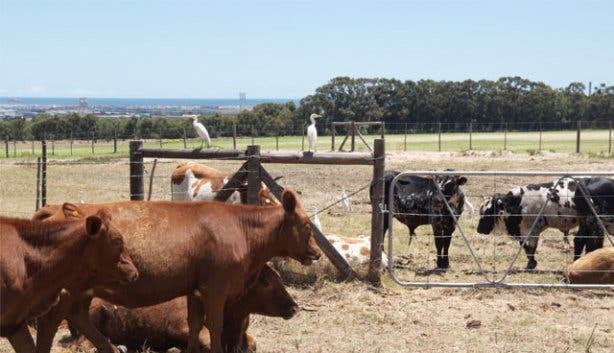 The farm has been in the Graaff family, a bloodline spanning from 18th century South Africa, for three generations. 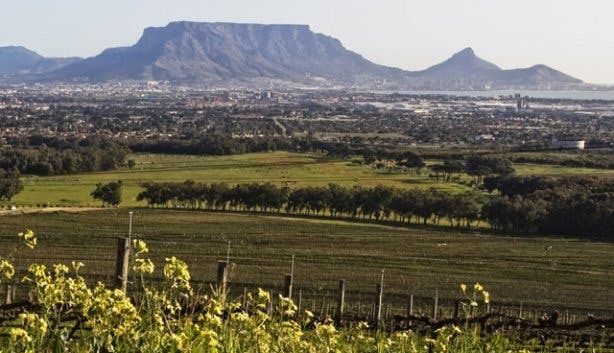 The current Graaff in charge is De Villiers, the fourth generation in this famed local family to dwell on De Grendel soil. 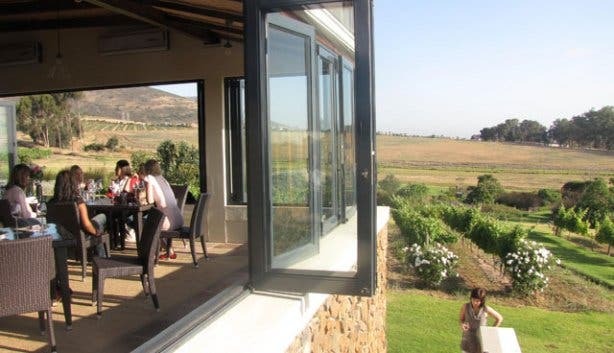 Originally used for breeding Arab horses, the farm turned to viticulture and winemaking, and now, most recently, the historic estate is a gourmet destination (the eatery opened in March 2012). On our way up to De Grendel Restaurant we pass long-horned Holstein cattle grazing on flower strewn meadows. We also pass antiquated signs bordering the road which warn: ‘look out for small dogs’. No chihuahuas jump out of the bushes, but there are spindly goat kids fraternising with fat geese at the gated summit of the road. This busy pen looks out over a dam alive with birds; flashes of bright orange and green cavort in the reeds bordering the body of water. 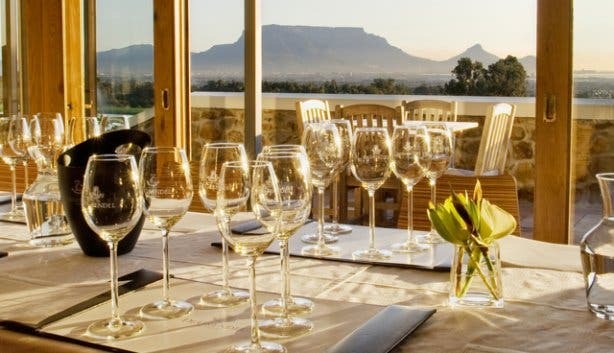 Overlooking this whole scene is the restaurant, a contemporary dining space with a bang-on view of Table Mountain and the sparkling city climbing its foothills. While the estate may be historic, there’s nothing old fashioned about it. The cellar, tasting room and restaurant are all part of the same cube structure. Earth tones and steel tie the look together. 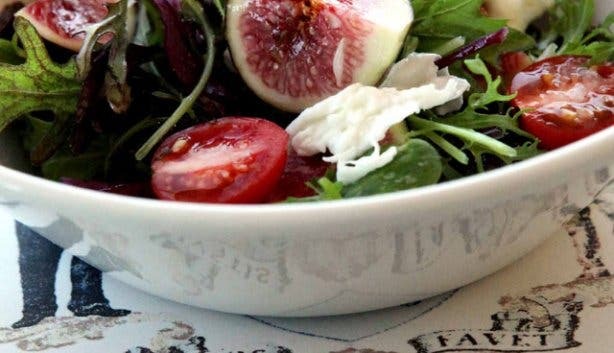 The restaurant is elegant, but down-to-earth, with décor that’s said to match the Graaff family home, complete with family photographs and blue-and-white china, the pattern of which is mirrored in furnishings and crockery. Our table is in the anterior section, and wraparound glass windows flood the room with both the view and the afternoon light. The kitchen, to our backs, is also glass-walled, and offers a different kind of view; one of chefs and steam. A smiling waitress brings over the menu, printed with today’s date. The dishes are influenced by the seasons and produce, as well as by the creativity of the kitchen team, so items change daily. The layout is intriguing: the ingredients of the starters, mains and desserts are listed without a description, so the actual composition of the dish remains a surprise. Although, the servers are happy to describe something, should you ask. My steak tartar comes beautifully plated—a speckled quail egg shell housing an egg yolk balances on finely chopped fillet. 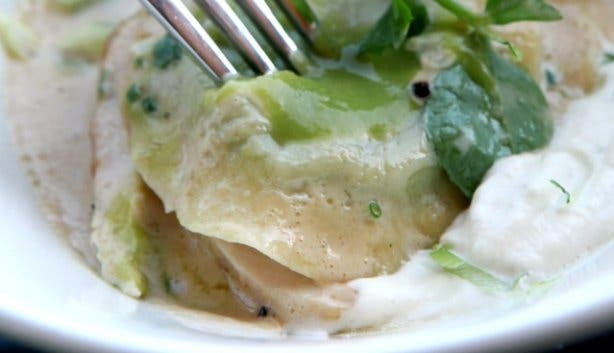 Next we scoop up parcels of chicken ravioli with gorgonzola cream and pea purée. We also try the squid and chorizo salad, which is the perfect combination of lemon, chilli and smoke. For mains, we dig into the restaurant’s signature dish: pork belly with apple croquettes. Dressed with a garnish of crackling for delicious texture, the succulent meat and sweet beetroot make for a winning combination. But, the highlight of the meal is the Indian spiced kingklip paired with slightly chilled De Grendel Pinot Noir. The spice of the dish is a perfect match for the cherry notes of the wine. 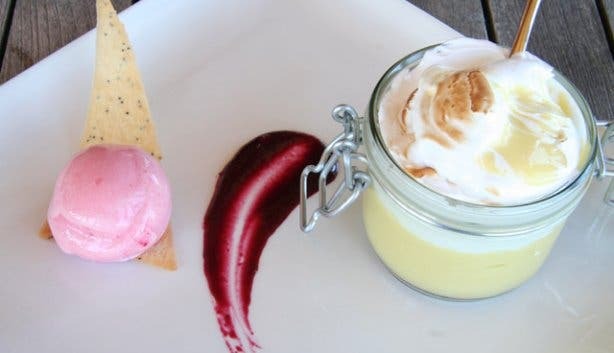 The chef brings over two shooter glasses of liquid popcorn as a pre-dessert. Then it gets even more playful with a sundae inspired by Elvis Presley’s love of peanut butter and jelly sandwiches. Layers of jammy jelly, crushed chocolate chip cookies and ice cream finish off a creative and delicious meal. 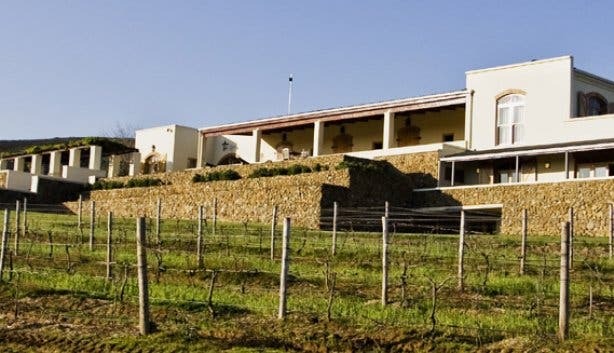 Well-priced – De Grendel wines also go for cellar door prices - the value is outstanding. 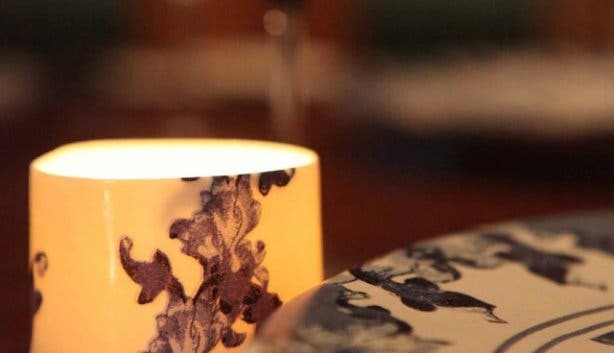 Straddling two worlds, the restaurant is the perfect choice for a Saturday date night, as well as a Sunday lunch destination with the kids. Tip: Ask for dishes NOT on the menu, the Elvis Presley dessert was one. Bill: Great value for average prices, starters from R50 to R75, and mains from R110 and upwards. 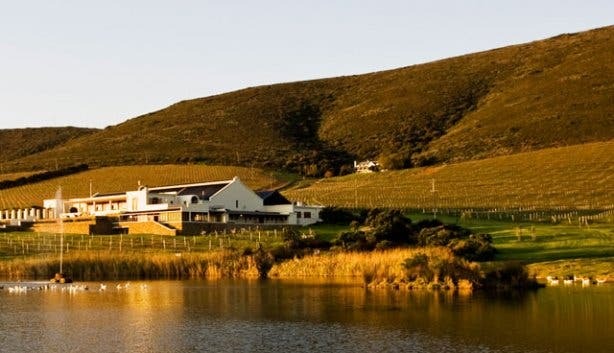 Read more about De Grendel Wine Farm in Durbanville.